At last I’d achieved a long held dream of flying backwards! 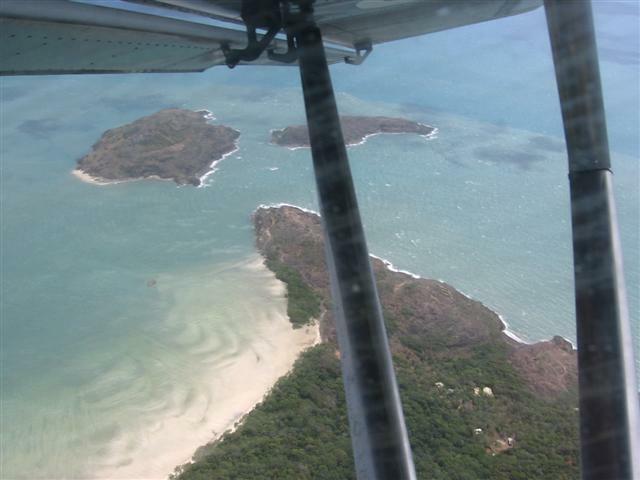 And to be doing it over the spectacular scenery of the tip of Cape York was doubly exciting! The GPS was reading up to 11 knots, tracking backwards for full a mile, as I ‘hovered’* the Savannah against a raging easterly wind, right over the northern-most tip of the Australian mainland – what a blast! I was on a flying adventure with Hans in his Zenith 701, and Bill in his Savannah. We’d started out from our home base airfield at Kilcoy, SE Qld., and had ridden this increasing SE’er all the way up the coast. It’s quite an awesome feeling to fly along those isobars that you see on the TV every night, knowing that they’re caused by a big high pressure cell all the way down at the other end of the country – brings all that book-learning meteorology and geography into real perspective. That sort of skill only comes from practice, practice, practice, and more practice, which we had all done lots of. Only a couple of weeks before, at Kilcoy, we three had done a really good review session of intense, short-circuit, round-and-round, very-short-final, on-the-dot-precision, crosswind landings – probably 30 of them. And that was just a review after lots of practice before. I did about 140 landings in the 25 hour test period in my new Savannah – until I didn’t have to watch the ASI at all, I just knew by feel what it was doing. Bill only had about 80 hours total flying at that time, but in that time he had done hundreds of practice landings, and had quickly developed a really good feel for any conditions. And whenever there’s a howling wind at Kilcoy, Hans sees it as a challenge, the more the better, so he’ll be up there going round and round and practicing. Lesson: Practice landings, and practice more landings, especially crosswind landings – knowing it in your head isn’t enough – your feet and hands have to have ‘the feel’. Once on the ground, even with the stick well forward to keep the nose wheel firmly down, the gusts would sometimes slew the aircraft right around. When we got to the parking area it was a problem getting out of the aircraft, because with no parking brake it was immediately blown backwards – had to hold onto the aircraft with one hand and tie down the nose wheel with the other. Sure glad this aircraft has nose wheel gear and sits at a flat angle of attack – a tail dragger angle of attack at this airspeed would fly away backwards. The 701 and Savannah aircraft handle these conditions exceptionally well. Those full-span flying ailerons give immediate and powerful roll control at any speed, with no adverse yaw at all. The elevator is equally direct and effective. The well-balanced tricycle gear touches down first on the mains, then you can either hold the nosewheel up for rough ground or set it down for excellent control in x-winds, reducing the angle of attack so there’s no tendency to bounce. Steering is direct and positive as soon as the nosewheel touches down. The 100hp Rotax gives heaps of thrust to climb away immediately if required. It’s kind of like a good 4WD – powerful and capable. We sure timed this trip exactly right, because next day the wind was getting around to the NE so we had some tailwind down the west coast of the peninsula all the way to Weipa. Johnnie A’s grand-daughter Nitta works at Weipa and she met us at the airfield to cart premium unleaded from town, but no premium anywhere in Weipa…. And the airfield refueler wouldn’t bring avgas on a Sunday without 24 hrs notice….. So we were stranded….. No camping on the airfield, so we hopped the fence and went bush, found a secluded grassy clearing, and set up our tents. Bill just happened to have a cask of red wine, which wouldn’t be allowed at the Aboriginal settlements we would land at farther south, so we sat around the fire and drank it, and pretended to be ‘long-grasses’. The flight down the west side of the peninsula was spectacular! An ever-changing vista of beaches, turquoise water, lagoons, meandering rivers, and salt pans, and that dark green forest stretching out of sight to the east. (And some really big mangrove swamps; just ideal for those canal estate developments…..) Only once in awhile a fishing boat anchored in a secluded lagoon, and several Aboriginal settlements. Flying is by far the best way to see such scenery – from the ground or water in that absolutely flat terrain you only see what’s nearby, there’s no grand perspective at all. The vivid lifetime memories of a spectacular day of adventure flying like that, is enough to justify the whole cost of an aircraft I reckon! The vivid lifetime memories of a spectacular day of adventure flying like that, is enough to justify the whole cost of an aircraft I reckon! And these aircraft like the 701 and the Savannah are just perfect for such exploring. Their high wing makes for good visibility, as well as shade in the hot sun. The tough tricycle landing gear, slow landing speed, and positive controls, make for easy landings just about anywhere. Stable handling makes for really relaxed traveling, and a cruise speed of 75 kts is just right to get a really good look at the country – wouldn’t want it any faster. We landed at Edward River to transfer fuel from the jerry cans, then quickly away before anyone came asking for landing fees. On to Normanton for full fuel up, and a long walk to the aptly named ‘Savannah Café’ for a hamburger. Good to stretch the legs, after 5 hours in the seat. Then on to Burke and Wills Roadhouse just before sundown, set up camp on the end of the airstrip, walk a couple of hundred metres to the roadhouse for a long hot shower, cold beer and a feed – Oh, it’s a hard life! At Longreach rang up gung-ho Bantam flyer Paul Douglas (1000 hrs in 5 yrs). 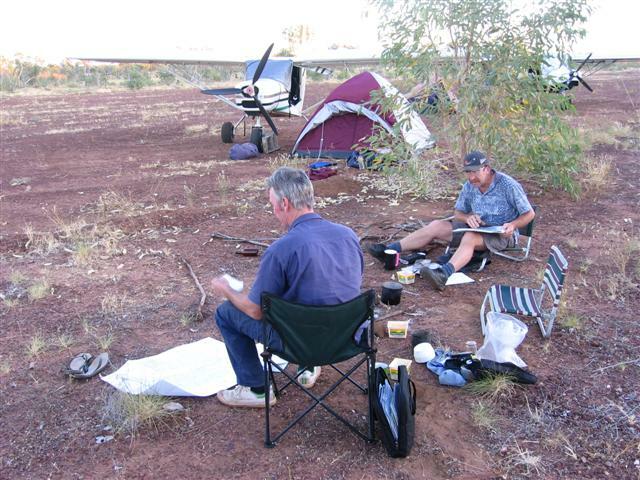 He was out to the airfield in minutes, arranged for us to camp in his hangar, hot showers, and lent us his ute to get around – now that’s welcoming camaraderie for you, so typical of the ultralight fliers! Next morning we ‘did’ the Hall of Fame and the Quantas museum. The 747 tour was the highlight – what a giant when you get up close and inside. I sure would have liked to see them fly it into that strip – that was a real ‘short-fielder’ for such an aircraft. Touchdown had to be absolutely spot-on, with the approach very low and slow over an evacuated motel - and he had to do it on only the two inside engines, as the outer ones were out over the edge of the bitumen and would have sucked in dirt. Must have been a really good feeling for the pilot when he did it so perfectly. Qantas museum 747 at Longreach. Late in the day we were headed for Rolleston, because I knew the airstrip was right next to town, and an easy walk to fuel and food. But sundown was coming even earlier than it did last night because we were now 4° of longitude to the east of Longreach, and that makes a difference of 16 minutes earlier. We would have made it with about 10-20 minutes to spare, but what if the airstrip was closed for some reason?? Nearest known alternate was 35 miles back and upwind to Springsure. Sure, there’d be property strips and paddocks in that sort of country, but couldn’t count on finding one in that time, in that light. Must always have a good alternate, so I was wanting to divert directly to Springsure, but another problem – my radio had quit transmitting audio some days ago. It transmitted carrier only, so we had been communicating by Hans or Bill asking the questions and I sending two blips for “yes”, one for “no”, and three for “don’t know…” Now I was blipping the button to call attention, and desperately trying mental telepathy to get them to ask the right question. We prefer to fly well spaced out and I was several miles behind so couldn’t catch up and use hand signals. I could hear them guessing what it could be that I wanted, and they kept asking, “Are you OK?”, to which I kept answering “blip-blip” of course. But the mental telepathy must have worked, because Bill finally asked, “Do you want to divert?”. Blip-blip. “Confirm you want to divert.” Blip-blip. “Do you want to divert to Springsure?” Blip-blip, blip-blip! What a relief….. Lesson: Discuss possible alternates when flight planning, especially when flying late in the day. Springsure turned out to be perfect for an overnight stop. The airstrip is on top of a hill right next to town, and the scenic ‘bluff’ and surrounding mountains looked really grand in the last sunlight. We’d only just tied down and decided to camp in the ‘terminal’, a three-sided shelter with water and toilets, when Donnie and xxxxx, who live right near the strip, drove up. They took us down to the pub and we had a fine evening learning about the area. Springsure and Emerald are riding on a boom right now, with several new coal mines opening up – lots of contractors in town and work for anyone who shows up with boots on and an ability to do something useful. After a good meal and more yarns the publican drove us back to the airfield – everywhere we went we had such terrific hospitality! Next morning Donnie invited us to breakfast, then took us to the servo to fill our jerry cans. Donnie used to fly a Mooney until it got to costly, but when he saw our aircraft and what they cost to run, I reckon he’ll being flying RAAus before long. Next morning low cloud confirmed that an upper level trough was coming as forecast, so we wanted to get home ahead of it. Fortunately it cleared just as we got to the Carnarvon Range so we were able to fly up and have a good look down into the Gorge – very rugged and spectacular! Bill marked the nearest airstrip on his GPS so he can come back and hike in there some day. Refueled at Roma, while another very helpful fellow buzzed into town with his ute to get us hamburgers - more country hospitality. The Darling Downs had had rain so it was a patchwork as far as you could see of rich red soil and vibrant green crops – farming was looking hopeful for a change…. The home stretch always seems like a long slog, especially 6 hrs bouncing around in afternoon thermals, but eventually we were headed ‘downhill’ off the ranges and over the familiar paddocks of our local patch. And there was Kilcoy Airfield, just where we’d left it fifteen days ago, but seeming somehow changed after all our adventures elsewhere…. Pull up to the hangar, switch off, and just sit there, overcome by silence……. It’s a very strange feeling arriving back to familiar surroundings after an adventure like that – sort of like it might have just been a dream…. Bill said he just felt like keeping on going……..